I have just started a run of four chairs for Springtime. They will be our new Greene & Greene chair, the Traditional Bow Arm, the Spindle Arm and the California West Bow Arm. You can get to participate in the process by selecting wood, finish and leather or fabrics. Stop by the shop and watch the progress of your piece as it comes to life. This is quality workmanship at its finest! This chair and footstool are a new design for us. The legs are solid cherry and feature the Blacker Leg Indent Detail from Charles Greene from 1907-09. The Cloud Lift Detail of side stretchers in Curly Maple create a stunning profile for the design. All the pieces are assembled with mortise and tenon joinery This design set the standard established by the brothers, Charles & Henry Greene. The leather is from Argentina and is a perfect match to the wood colors. This Chair is a direct reflection of the work done by William Morris in England in the early 1900’s. We have taken a bit of our own design to make it modern. This chair and the Bow Arm Chair feature quadralinear leg post construction. These posts have 4 quartersawn boards mitered and then glued. This construction technique best displays the oak’s ray flake which seems to wrap around the leg. The Chair is shown in red leather, ultra-suede and cloth. 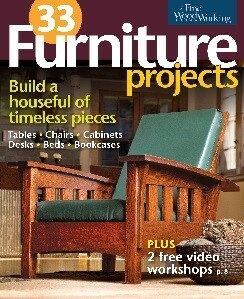 Our design of this chair was featured on the cover of Fine Woodwoking’s new book on the 33 Best Furniture Projects! When asked, I will say that we have done close to 50 of these Chairs in the last 30 years. A great comfortable chair. Shown in 2 colors of leather and Ultra-suede. Using Cherry from Tennessee and quarter sawn red oak from the Indiana area we have designed a contemporary rendition of our award wining Bow Arm Chair. All our chairs have a 5-position back adjustment. We have had requests from customers about reducing the size of the chairs. We custom fit many chairs to fit the stature of the buyer. Just a bit less deep and slightly narrower to fit the customer perfectly. If you have any questions just give me a call.